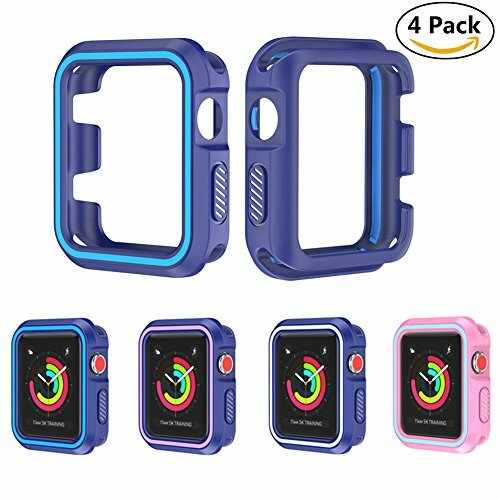 Fit all Series - This iWatch Case compatible with apple watch series 3, series 2, series 1 all editions. Lightweight and slim design - Not add any bulk to your Apple Watch while providing full corner protection. Perfect fit - Easy access to all features (buttons, camera, Sensors and ports), directly charge and swap band, no need to remove the case. Soft bumper case - Durable and soft silicone material covers your watch side and edges perfectly, shock-proof and shatter-resistant. Specail design - Raised lip protects the flat screen against accidental drops on smooth surfaces. Convenient to use - Snap-on the case on your watch and you're set. Easy to install & remove. 1. Screen Protector NOT included. 2. Please choose right size for your watch. If you don't know the size, please check size number on the back side of apple watch. 【UNIVERSAL DESIGN】- This exquisite case is specially designed for Apple Watch 38mm Series 3, Series 2, Series 1 and Nike+, Sport, all editions. Enhances its most natural beauty. (Please note: Apple Watch or band is not included). 【SHOCK-PROOF】- Made of durable, impact-resistant silicone, this iwatch case protects your apple watch against scratches, drop and bump. 【MAXIMUM PROTECTION】- Durable and soft silicone material cover the side and edges, raised lip protects the flat screen against accidental drops on smooth surfaces. All-around protection for all corners and holds Apple Watch tightly. (Please note: Not including the screen because it affect the using experience). 【ULTRA-THIN】- Lightweight and ultra-thin case fits perfectly around the watch without adding any extra bulk. It is also a classy looking on your wrist. You will get 4Pack case, you can change the color to fit your mood and outfit in daily life. 【PERFECT FIT】- Snap-on design provides easy installation, no need tools. Easy access to all features (buttons, camera, Sensors and ports). And no affection to band insertion or watch charging at all.